Tali Hinkis and Kyle Lapidus are LoVid, a New York-based artist duo that has been collaborating since 2001. With an eclectic practice that spans performance with self-made synthesizers to experimental textile design, LoVid reconstitue analog and digital media across mediums and spaces—with a sense of play and a nuanced engagement of material. Some highlights from a truly impressive artist’s CV: LoVid's installations and objects have been featured at institutions including The Neuberger Museum (New York), Netherlands Media Art Institute, Science Museum Jerusalem; they have performed at MoMA and Eyebeam in New York City, and FACT (Liverpool); and their video works have been shown at Modern Art Oxford, Siskel Theater (Chicago), and International Film Festival Rotterdam. 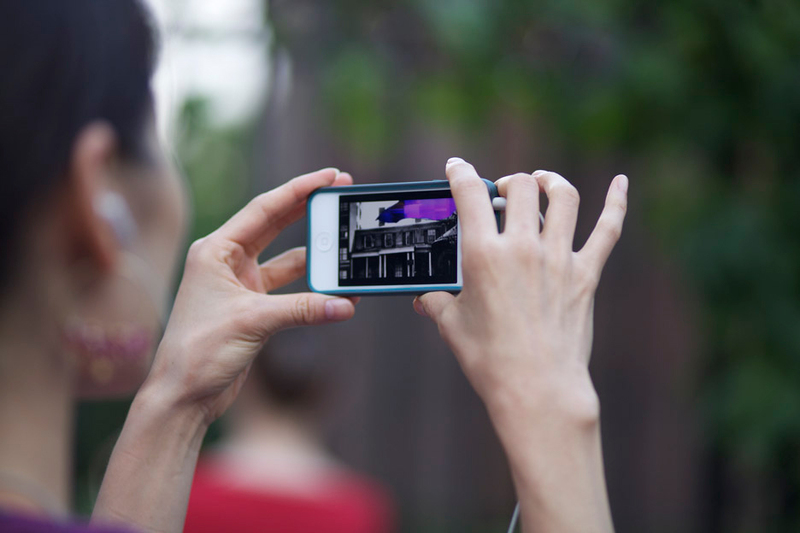 Whether software or hardware, many media artists hide the technology they use and keep it sequestered from the viewer and/or in the service of slick effects. You two let it all hang out, and embrace the inherent messiness of tech—tangled wires, scrambled signals, ephemerality. To get us started, how would you summarize your relationship with technology and media to someone just discovering your practice? LoVid: Well it is important to keep in mind our earliest interaction with media as artists. In our early 20s while we were in college/art school (Tali in France, Kyle in USA) the technology of the time was very physical. Tali started working in video, which at the time included U-Matic tapes, and a lot of connecting VHS decks to one another, cameras, TV, etc. This was before what was called ‘non-linear editing’ was easily accessible. Kyle at the same time was learning (among other things) electronic music and the tools he was most interested in were predominantly big synthesizers (Serge or Bob Moog style) and contact mics. 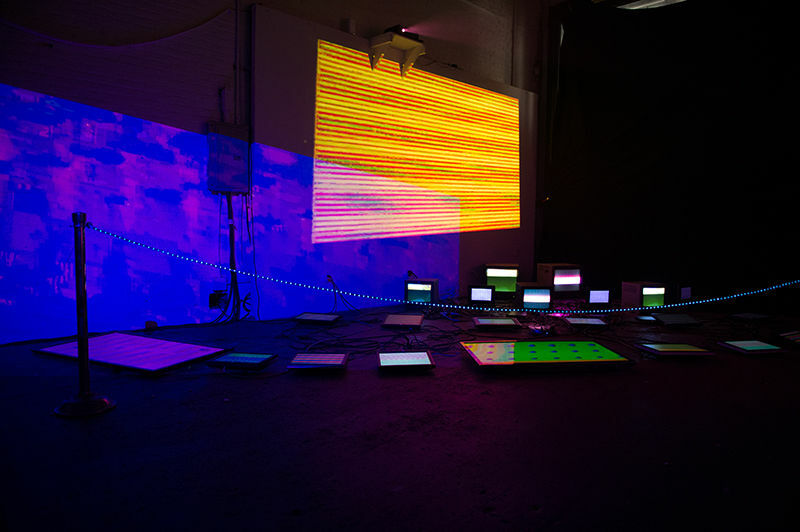 So the physicality of media, the cables, running signals etc, was just part of the technique of being a media artist in the ’90s and it has shaped the way we think of technology. For us, media and technology are very much an extension of our artistic gesture, sometimes very physically by turning knobs and plugging machines, and sometimes more metaphysically when technology we use affects how we see the world. 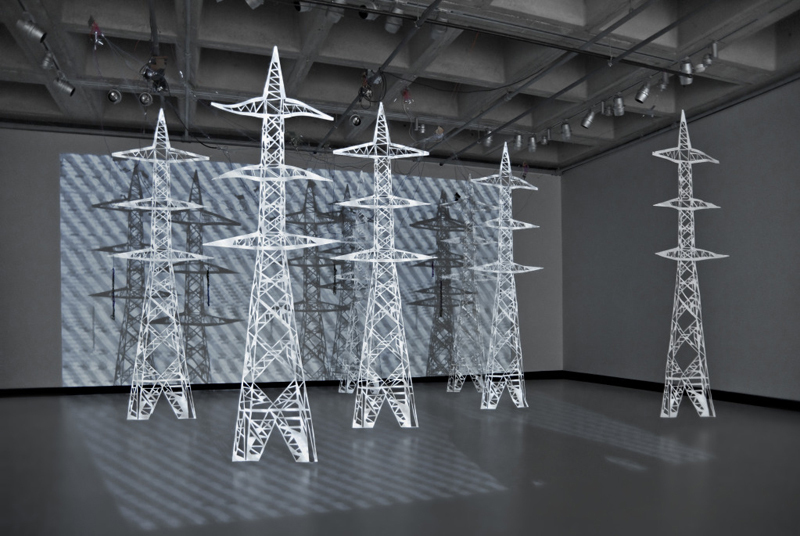 In addition to being influenced by other video artists (especially pioneers like the Vasulkas) we also feel very connected to experimental live cinema artists (Tony Conrad, Bruce McClure) whose work really is about the materiality of light and film. And finally, we have always also worked within the milieu of experimental music and noise. So we think of the technology we use for video similarly to how musicians view their instruments. And you make and play your own instruments, of course—synthesizers have remained a mainstay for you. How did you take that early influence, of the ‘Moog style’ synthesizer, and reshape that as a medium to explore within your practice? Our AV synthesizer is actually directly inspired by the Dan Sandin Image Processor designed in the ’70s. In 2003, we went on our first residency at the Experimental TV Center in Owego, NY that was a center for 40 years of experimental media and the birthplace of many of the US based analog video tools and central to video artists (particularly pioneers such as Dave Jones and Matthew Schlanger as well as Sandin and Paik). That’s when we first worked with these tools. 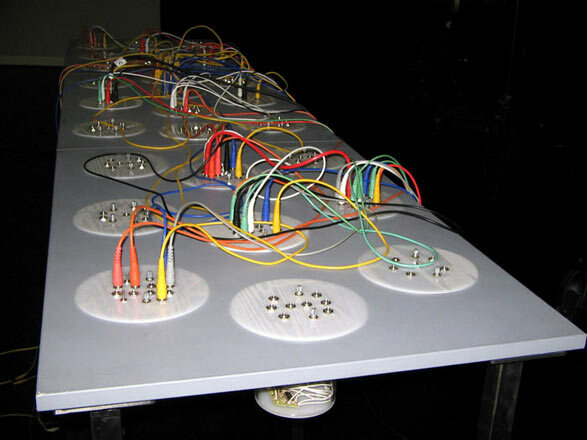 Since we were already involved in the music scene that included synth builders, hackers, and circuit benders (from Nic Collins to Peter Blasser), it was a logical transition to start making our own instruments. In general, we feel that the pioneer generation of analog toolmakers were often concerned with engineering an ultimate technical tool that could be stable and make any kind of visual effect. For us, building instruments is more about the specific fragility of the interaction between technology and the natural world/human body. So our technical designs are always slightly wacky, leaving lots of room for chance and sometimes failure. It’s also why our instruments are always sculptural and often include exposed electronics. We like things very transparent and raw. 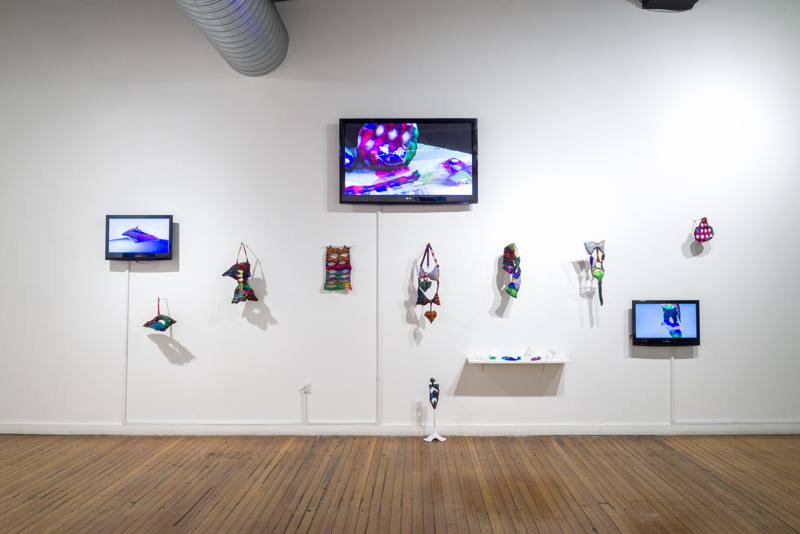 Your recent projects Reaction Bubble (2016-17) and Reaction Wear (2014) saw you team up with practitioners from ceramics and choreography to create space, movement, and ritual around your works. What did working with practitioners from these disciplines teach you about your practice? Collaboration is a big part of how we work, especially on big ambitious projects where we always learn something from other artists. Time and process are extremely different in other disciplines. In ceramics there are very specific physical limitations and constraints of the material, such as drying time, which was fascinating to observe. Luckily our collaborator Matt Towers is a real craftsman and he was able to take on some very challenging aspects of the medium such as working with conductive glaze. For the choreography, Deborah Goffe also had limitations of needing actual bodies to work with for the creation of the piece rather than working on the composition on her own. Another interesting aspect that was particularly key for this work was the use of space, a lot of our work is video or wall based and working with three dimensional objects and dancers that move in three dimensions was very interesting. We were lucky to have incredible support from Real Art Ways and the Robert Rauschenberg Foundation and a lot of access to the exhibition space throughout the four years we worked on this piece. Some other thoughts from Reaction Bubble that we can bring into our future projects include Matt’s vast knowledge of the history of objects and design and his ability to draw inspiration from them, for example a basin to inspire the bowls. In media there there is a more concise history to draw from and it was inspiring to think beyond technological objects when designing an interactive sculpture. Dancers and live performers have a way to powerfully command audience attention, and is something we attempt to channel in our performances. Deborah worked with the dancers to come up with a very specific movement vocabulary for our installation, and we hope to incorporate some of this language in future projects. In your last interview with Sediton in 2016, you talked about your interest in the link between electrical engineering and physical craft. This is super interesting, because your aesthetic seems to flow across mediums: one can see consistent patterns, textures, even logics of assembly. In that dialogue you talked about your synths specifically, as a point of inspiration, but I’m wondering if you can expand a bit and detail how this thinking has evolved over your career? Technically speaking, each part of our production really does include both. When we design software or hardware there is also an aesthetic element and often design constraints, depending on materials, scale, etc. that the technology needs to live within. When producing visual art works such as textile pieces or even paintings, we are always looking back at our media works, specifically video. Also our compositions for the visual works always include elements from moving image, such as glitch aesthetics or flicker frequencies. The evolution of these thoughts throughout our career is perhaps more in the awareness and articulation of this interest. We always have focused on working with DIY tools and non-traditional technologies in our work since we wanted to challenge the perception of technological tools. 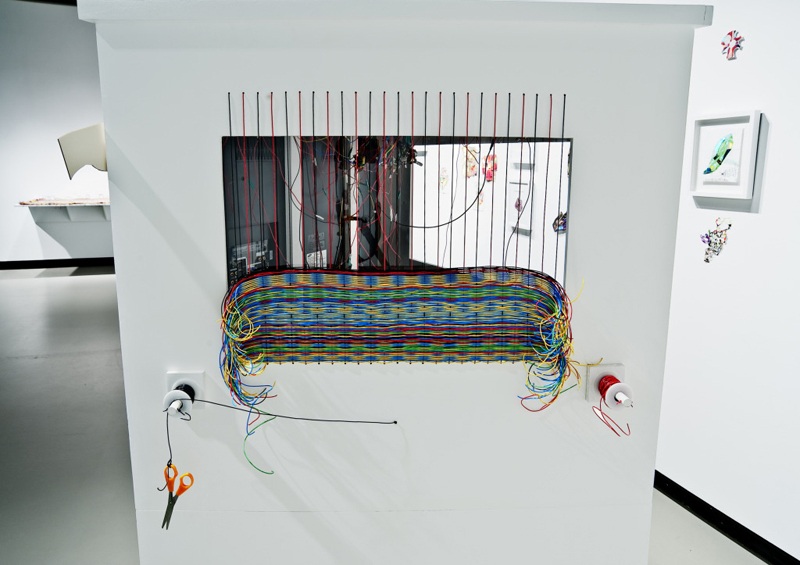 We used the terms wirefull and retro-futuristic very early on in our work (2003) representing our very visceral, tactile, and raw approach to technological tools. It took us some time to articulate how working with technology affects the work we do and how we see the world. This has also been evolving at the same time as consumer technology has developed and mobility, social communication, and relationships with digital reality have become the main focus of technological evolution. As a result, our work from 2012 on has incorporated not just the materiality of this intersection but also the changing perceptions, mixing and collapsing of realities, as well as physical and virtual spaces. I can see that shift pretty clearly in, iParade (2010-15) with its site-specific geolocated videos. Aside from the ubiquity of the smartphone, what specific technological or cultural changes inspired this new direction within your work? We are very interested in the interconnectivity between technological objects. The so called ‘internet of things’ or at least the possibility that media/information can be more dispersed and impact an environment rather than one machine. There are obviously reasons to be wary about the culture of surveillance and loss of privacy, but the idea of translating various signals into media projects is a way we work through these concerns. And we are excited to think of a future that is more liberated from devices, where media is integrated in other ways in our natural experience of the world and our biology. 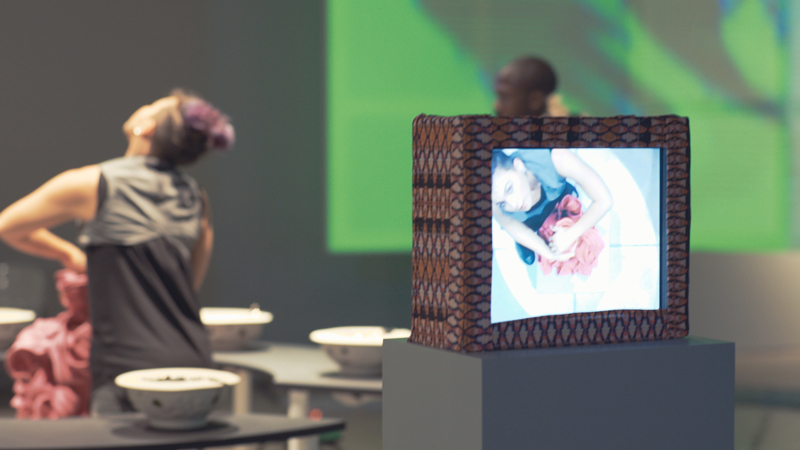 How is working with analog and digital video similar to textiles? Aesthetically we can see the connection in looking at your work—but I’d love to hear your experience working across them, and about the insight you’ve gained. Working between digital and analog is a way to create a structure and unleash raw energy within this structure. The digital systems we are currently using allow us to expand our actions, enabling us to manipulate and control the raw electric signal. The analog signal is a metaphor for basic elements of life such as time, energy, and emotional, nonverbal communications. It may sound hyperbolic but that is where we get excited and feel really connected to the process of making art in real time together. Some of the most intense moments in our lives have been performing live analog video in very raw and fragile state where our bodies have to balance the instrument physically and the image/sound technically. The digital tools that we create are there to liberate us from being too tied to the physical instrument and to use the actual space and bodies of performers in interesting ways. Incorporating digital tools also helps on a technical level making everything more reliable since our instruments are usually very unpredictable. Comparing this process to working with textile, connections include the contrast and combination of machine produced prints and sewing with handmade work in the painting, collages, and in the quilted stitching as well as bringing the electrical signals into the physical world. 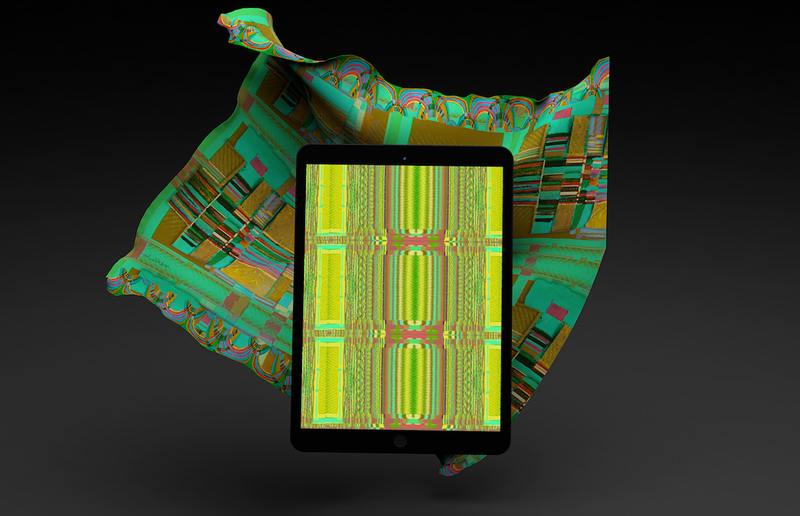 LoVid have released a special edition on Sedition, including a new video art piece titled Aluminism along with a limited edition art scarf, exclusively designed for Sedition. Read more and collect.